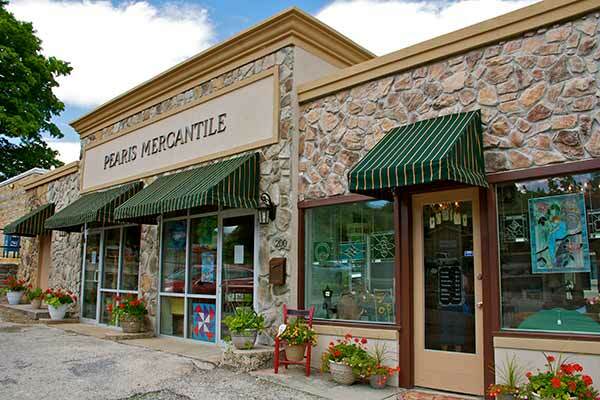 Celebrating its third anniversary on May 5th, 2017, Pearis Mercantile is a welcoming gift shop located across from the Visitors Center in Pearisburg. Owner Ann Wheeler and staff invite patrons to shop Monday through Saturday, 10am until 5:30pm and on Sundays from 12:30-5ppm. They can also be reached by telephone at (540) 921-2260. Their physical address is 200 N Main Street, Pearisburg. The parking lot often buzzes with cars in and out buying unique giftware or local artisan products at the Mercantile. Their seasonal selection is eclectic and comprehensive. The smiling staff are on hand to show you a new inventory that just arrived or help you select the perfect item for your days shopping trip. From their windows you can see assortments of garden and full-size flags, wood-painted quilt squares, and beautiful stained glass treasures. The windows though, are just a hint at the variety of quality products inside. Jewelry, soaps, baby and wedding gifts, as well as novelty napkins and cards are all available at Pearis Mercantile. Happy Business Appreciation Month & National Teacher Appreciation Month!